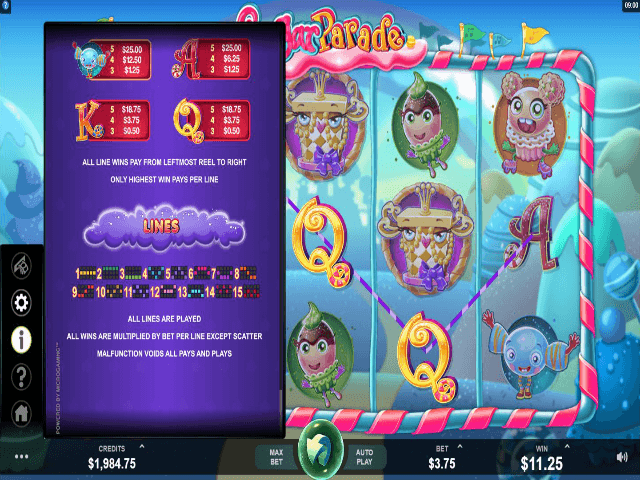 If you're looking for a way to make a sweet profit in the online slots world, there's one spinner that stands out from the crowd – and that's Sugar Parade. Developed by Microgaming, this game is one that's as big on imagery and entertainment as it is on prize money. 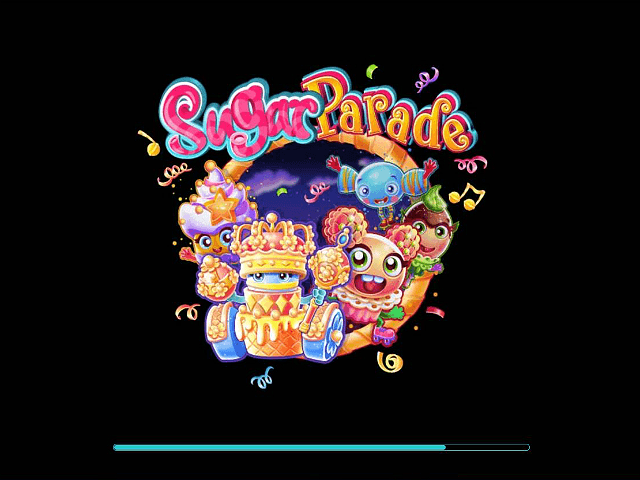 To give you a taste of what this game is really like, we've compiled a quick Sugar Parade slot review for your reading pleasure. Covering everything from the way you play to the amount you can win, this Sugar Parade guide will tell you all you need to know about this tasty treat. As you'd expect, Sugar Parade's theme is colourful candy. In real terms, this means the characters and symbols are all bright, quirky and look good enough to eat. 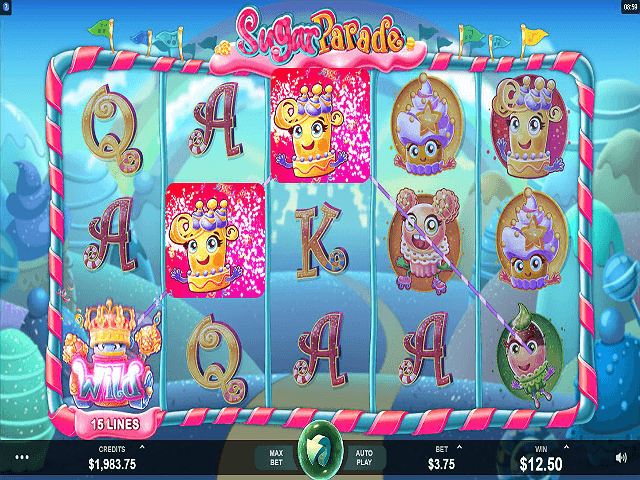 For those who love video slots that don't take themselves too seriously, Sugar Parade is a treat. You can see from the laid-back layout of the five reels and 15 paylines that there's a clear emphasis on lighthearted fun. Instead of the betting bar being filled with buttons and options, you'll only three numbers and a spin button. Basically, what the design team at Microgaming has done is streamline the bar and make it is innocuous as possible. Doing this not only makes the betting process a lot less complicated, it allows you to focus on the actual game itself. Fixing your focus on the reels makes Sugar Parade all the more immersive. Before you can turn the reels and sample Sugar Parade's cash rewards, you'll have to set your bets. Initially, you'll have to choose a coin size between 0.01 and 1. Once you've done this, you then have to decide how many coins you want to wager across a single payline. Now, at this point it's important to note that there are 15 paylines in play and you can wager as many as five coins per line, which means the max stake is 75 units per spin (1 x 5 x 15). After you've found a total bet that suits your bankroll, it's time to start shooting for prizes on the payout table. In this video slot, three or more matching symbols (i.e. card symbols or various types of sweets) will unlock a prize worth between 0.10 (at the lowest stakes) and 37,500 (at the highest stakes). To really make this game come alive, you should look beyond the 37,500 jackpot you win by aligning five wilds. 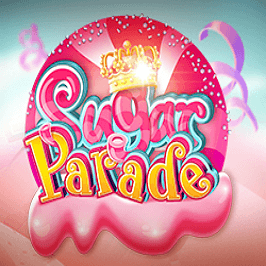 To satisfy your sweet tooth, you need to unlock Sugar Parade's free spins. By rolling in three, four or five scatters (the yellow ice cream), you'll earn 10 free spins. What's different about this bonus is that you can re-trigger your gratis turns indefinitely. Moreover, any wins you bank will be tripled! 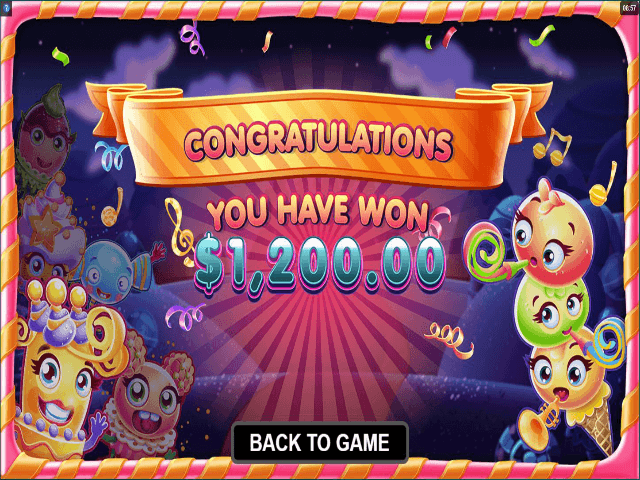 When you combine this with the top jackpot, it's possible to win close to 120,000 units when you unwrap the sweet delights of Microgaming's Sugar Parade. If you like Sugar Parade - You'll like these slots too!